After Nick and I discussed it, we tweaked the book cover to what you see at the left. Now we have to create the spine and back cover before I can upload STARLING to a trade paperback size. Arrgh, more formatting, but that's okay. I think when I have an actual book out there, my "sail into history on the winds of fiction" will be a little more seaworthy. I'd like to set up a pre-order, but I'm not real sure how that works and, heck, I'm not even sure who I'm gonna have print it yet! Please enjoy the snowflakes and stars falling from the cursor, courtesy of SimpleSite. PS: ) I also added a section, under LOCATIONS, for Sheet Harbour. Thanks to all of you who came to the Local Authors Showcase at the James H. LaRue Library on Saturday. Special thanks to Lisa Casper who puts on this program every few months for us "starving authors". Now if I can boost the sales of EMERALD TARGET: Book I - STARLING, I'll be sailing into a writer's paradise! 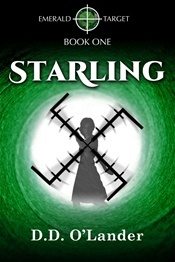 STARLING can be purchased for $7.99 on either Amazon.com or Smashwords.com. Thanks for considering writing reviews, too. Good reviews will help spread the word. The blog that's got my heart racing! EMRALD TARGET: Book I - STARLING is available!! You can find it both on Amazon.com & Smashwords.com. It does contain some adult content, so I realized in Smashwords you need to go to the bottom of the list and check the box so it brings up adult type books. Of course what I wrote isn't anything that would shock most teenagers, but I wanted to err on the side of caution. Sassafras & pumpernickel! : } I’m really bad about this blogging stuff! More than a month has gone by and I’m just now getting to this. Photo is a calming view of Sheet Harbour at sunset, 2006. However, a lot changed which has kept me busy, busy. Though EMERALD TARGET has remained the series name, the mega-book has been split into three, so I guess that makes it a trilogy: Book I - STARLING, Book II – IRISH, Book III - PAWN. A graphic artist named Nick Zelinger of NZGraphics is working on the cover design; we probably only need a tweak or two more and it’s done. 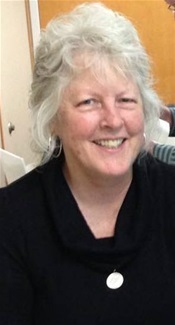 A sweet, patient techie lady named Gail Nelson is making sure STARLING is properly formatted for an eBook. And I’m still signed up for the Local Author Showcase on Saturday October 11 at 2:PM. It's marked on my calendar as D-Day, so hopefully this landing will go as well as the overall landings on Normandy, 3 years later than my book's time frame. 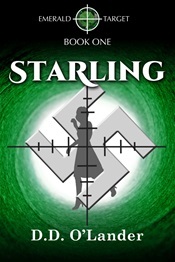 Right now, I need to finish filling out the Bowker info about my book, so there is something connected to the ISBN for EMERALD TARGET – STARLING. Even though I’d been forewarned, I never knew how much stuff there was after the fun of writing the books! Amazing! !